In Our Screen-Filled World, Do We Still Need HD Displays? The Jupiter Fusion Catalyst 8100 is a localized version of the FC 8000 family with menus in simplified Chinese characters. 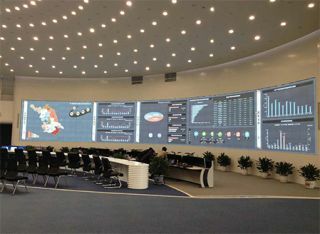 The video engine is at the heart of the network operations center (NOC) for the Jiangsu Electric Power Company that watches over the electrical grid in eastern China. Some of the system’s 32 inputs streams show remote video throughout the grid, while others bring in graphs of power production, as well as the output of sensors at strategic points. High-definition displays are everywhere these days, from meeting rooms and advertising displays to bars and lobbies, but Ultra High Definition (UHD) screens will soon make them passé. With over eight million pixels—more than four-times that of an HD image—at your disposal, 4K displays are all the rage these days. By delivering a new level of detail and richness, they set a higher bar for screens. But, what if rather than the goal, ultra-resolution was the starting point for creating super UHD displays that show tens of millions of pixels, or more? It’s attainable today, regardless of whether it’s to preview an upcoming ad campaign at a convention, integrate a multitude of data screens in a control room or create a digital canvas on which to paint with light. In other words, the more pixels the better when it comes to wowing viewers with a startling level of depth and detail. While BenQ’s latest IL series of displays allow you to daisy-chain up to nine displays to create a composite image video wall image with more than 18-million pixels, most composite images require a video processor working behind the scenes. The best not only scale the images to the right size and divide them into discrete parts, but routes them to the correct display and allows you to rotate through several sources, if needed. Built around a pair of Intel’s six-core Xeon processor, a chip that is more often at the heart of high-end servers, Jupiter Systems’ Fusion Catalyst 8000 family has serious video horsepower. Many are based on high-performance PCs and can often work with specialty processing cards for special effects or use with broadcast video feeds. Built around a pair of Intel’s six-core Xeon processor, a chip that is more often at the heart of high-end servers, Jupiter Systems’ Fusion Catalyst 8000 family has the video horsepower for even the largest wall. This makes the FC 8000 the Ferrari of video engines and has the ability to stream up to 320 gigabits per second of video data to individual displays at full frame rates while monitoring and optimizing the data traffic so that everything runs smoothly. The rack-mounted video engine can deliver more than 100 individual 2,560 by 1,600 video streams in 32-bit color to a series of screens in a video wall. Regardless of whether you use projectors, display panels or video tiles, it’s enough for a class-leading composite display with the potential to deliver several billion pixels. “In other words, the Fusion Catalyst video processor pushes a lot of pixels around,” said Brady Bruce, VP of marketing and strategic alliances at Jupiter Systems. A big bonus is that if you also use Jupiter’s Canvas 2.1 collaboration system, you don’t need to use a full computer or even a notebook to create the video wall’s image. It can come from an iPad, iPhone, or Android device, although the phone or tablet’s image will have to be scaled up by the FC 8000 to the resolution of the video wall. The Fusion Catalyst 8100 is a case in point. It is a localized version of the FC 8000 family that has menus in simplified Chinese characters. The video engine is at the heart of the network operations center (NOC) for the Jiangsu Electric Power Company that watches over the electrical grid in eastern China. Some of the system’s 32 inputs streams show remote video throughout the grid while others bring in graphs of power production and use, as well as the output of sensors at strategic points. A recent visual homage to the Spanish painter El Greco in the southern city of Toledo featured creative high-resolution technology. Called Luz Greco 2.0, the visual feast was created by ganging together four Barco projectors. The digital artists used a pair of HDQ-2K40 that put out 2K resolution at up to 40,000 lumens each alongside two HDX-W20 projectors that produce HD images at up to 20,000 lumens. One of the most advanced NOCs in the world, all this video is sent to a wall that’s composed of more than 400 Prysm Phosphor Layer video tiles that cover more than 800 square feet of screen space. It encompasses a long curved strip of video that has a resolution of 20,496 long by 2,880 high, or roughly 60-million pixels that company technicians continually scan for problems and opportunities on China’s power grid. For example, one might be looking for hot spots in the province’s high-voltage power lines, while another has her eye on an individual power plant that is vital to keeping the lights on and a third is looking at the day’s power demands versus long term trends in power use. The key is that because it is a single large screen, they are all looking at the same information. In addition to utilities, there are video walls used in traffic control, law enforcement, and public events, but they don’t have more impact than when used in the classroom. While many engineering students at Texas Tech students might wish their eyes could wander from the lecture hall’s big screen, the Prysm-based wall grabs their attention with a 23- by 5-foot interactive space that fills the wall behind the room’s lectern. The wall is used to show students everything from a swath of equations and molecular diagrams to simulations of how underground oil reservoirs evolve. Rather than an array of LCD screens or projectors, Prysm’s laser phosphor display tiles create an image 20-inches on a side with a minimal break in the image between tiles. This lets designers stack them to create huge walls. The tiles work by shooting a laser beam onto the inside of a phosphor coated glass screen. Wherever the laser excites the phosphor, an image is created, allowing unmatched flexibility when it comes to setting up video walls. While projectors haven’t kept up with LCD displays in terms of resolution, a lot can be done to create multi-image displays by mapping the output of anything from a few to dozens of devices. For instance, in 2008 the city of Quebec celebrated its 400th anniversary with a blow-out party that included the Image Mill light show, one of the largest projection arrays ever attempted. All told, 27 Christie Roadster S+20K projectors were used to project a series of images and videos onto the walls of 81 grain silos on the banks of the St. Lawrence River. Inside each S+20K projector is a trio of digital light processing imaging chips that put out an SXGA image at up to 20,000-lumens of brightness. That may not sound like much, but when the output of 27 of them is combined, they create an astounding piece of digital visual art. All told, the projectors delivered roughly 1 billion pixels across 200,000 square feet of projection surface on the banks of the St. Lawrence River. Created by Quebec native Robert Lepage, the light and sound show retold the story of the founding of the city with images and video from the city’s past. The 40-minute light and sound show included a pastiche of Canada with everything from paintings of Samuel de Champlain —the city’s founder—and a hockey scoreboard to stained glass windows and animation sequences of elk running across the surface. The show hit a high point when video of flames were projected onto the silos to commemorate and recreate the 1845 fire that tore through the city. By contrast, sometimes just a few high-output projectors are what it takes to map images to a wall and create a breathtaking effect. Take this summer’s visual homage to the Spanish painter El Greco in the southern city of Toledo. Called Luz Greco 2.0, the visual feast was created by ganging together four Barco projectors. The digital artists used a pair of HDQ-2K40 that put out 2K resolution at up to 40,000 lumens each alongside two HDX-W20 projectors that produce HD images at up to 20,000 lumens. At its start, the light show included making some of the church’s intricate features appear to rotate and then disappear as the city’s medieval cathedral was deconstructed into darkness. At the climax, the show mapped everything from the “Disrobing of Christ” to the “Adoration of the Shepherds” onto the crenulated walls and spires of the church to spectacular results. In other words, it took 21st Century video technology to make a 16th Century artist’s works come alive. The What: RGB Spectrum is promoting the features of its Galileo Display Processor, which adds the benefits of PC-based systems, such as IP inputs and the ability to run applications natively on the processor. The What Else: The Galileo processor’s modular design allows it to support a full range of input and output types (IP, analog, DVI/HDMI, 3G/HD-SDI) with resolutions up to 3840x2160 (4K). The Galileo processor can also deliver HDCP protected content to an unlimited number of displays, while other PC systems either do not support HDCP at all or impose severe limitations on wall size. One More Thing: The Galileo processor supports H.264 decodes for video. In addition, the incorporation of our exclusive VDA remote desktop technology, with integrated KVM capabilities, allows the Galileo processor to provide operators with low-latency control over remote systems and equipment via LAN/WAN, as well as the ability to monitor remote alarms, and create advanced scripts with its remote API. Visit www.rgb.com for more details.